Kettle Pond is the northern parcel of the Ninigret National Wildlife Refuge. It is also the parcel that is home to the Rhode Island headquarters of the National Wildlife Refuges. Inside the building there is information on the types of lands and animals found throughout the refuge. This property also has a handful of trails. This would be my second of three planned walks on this refuge. 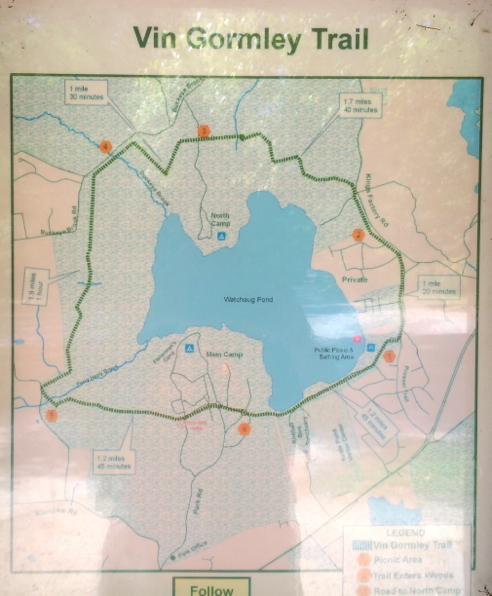 I started from the parking area near the headquarters building and followed the Watchaug Pond Trail to its end passing both the Burlingame Trail and Toupoysett Pond Trail. I continued further down a dirt road and then turned left. 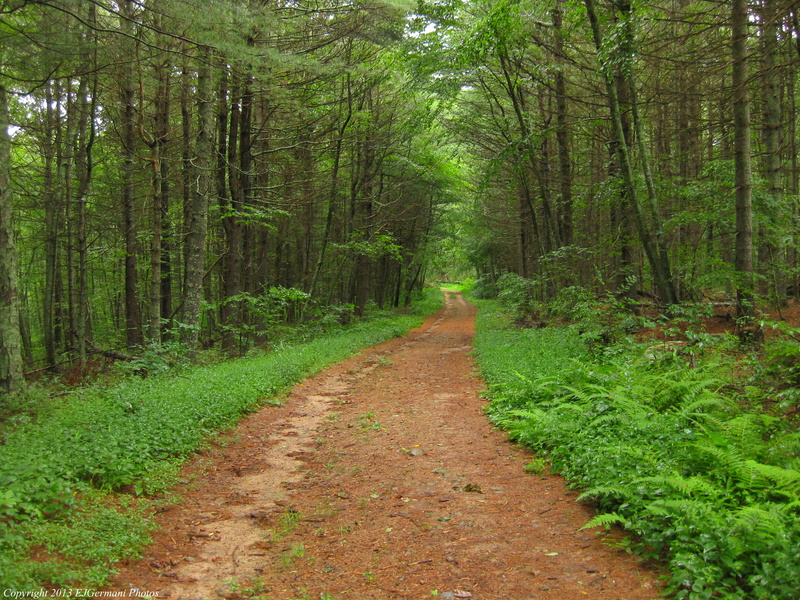 I followed this road for a few paces to the entrance of the bordering Audubon property. From here I retraced my steps back up the dirt road and along the Watchaug Pond Trail. I then turned right onto the Toupoysett Pond Trail passing through part of the Kimball Wildlife Refuge as the trail looped back to the Watchaug Pond Trail. I then turned right, and then right again onto the Burlingame Trail and followed it to the edge of the Burlingame State Park. From here I retraced my steps back to the Watchaug Pond Trail, turning right again, and going back to the parking area. On the opposite side of the building is the Ocean View Trail which leads out to an observation tower. From the tower you can see Ninigret Pond and the Atlantic Ocean. On a clear day you can also see Block Island. After sightseeing for a bit I returned to the parking area. This property borders both Kimball and Burlingame and several miles could easily be added to this hike. 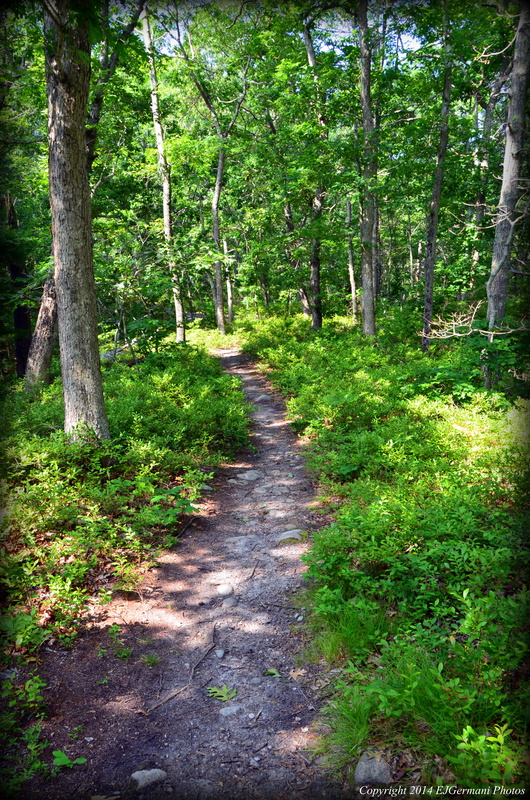 Trail map can be found at: Kettle Pond. I started this hike from the parking area by the nature center and started following the red trail. I was immediately met by a flurry of small birds including many sparrows and woodpeckers. 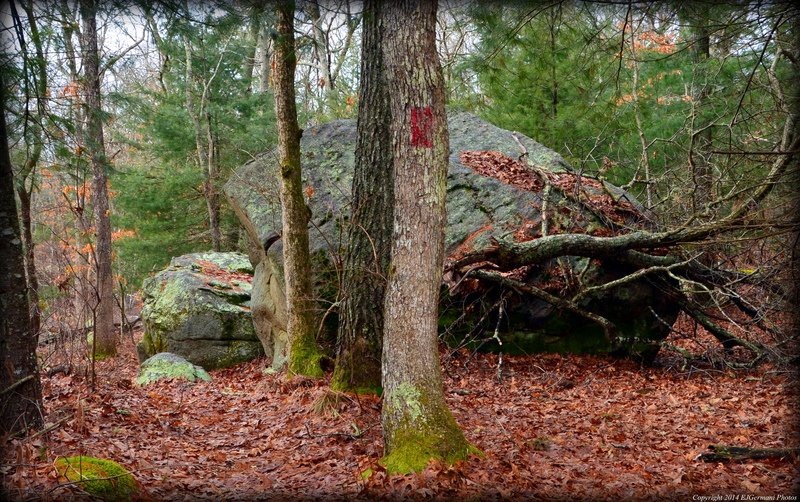 I followed the red trail to its end as it wandered through areas of forest and boulders. I then turned left onto the orange trail passing a small pond. At the next intersection I turned left and followed the green trail. There were many trees down at the time of this hike and I had found some difficulty following the green trail but I did manage. I then turned left following the blue trail. This trail merged with the yellow blazed Vin Gormley Trail for a bit. There are a couple narrow trails that lead to the shore of Watchaug Pond and I took advantage of them for some photography. I then resumed following the blue/yellow trail until the blue broke off to the right. I continued following the blue trail through a memorial garden and then left back to the parking area. Trail map can be found at: Kimball. 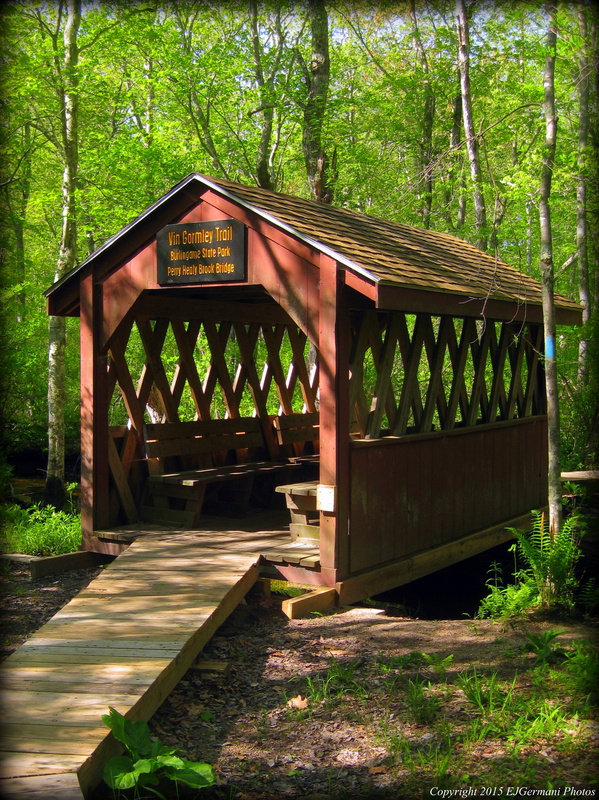 This hike, known in Weekend Walks in Rhode Island as Burlingame North, is mostly on closed off access roads of the Burlingame Management Area which makes for a nice and easy walk. It starts at a parking area along Buckeye Brook Road. After passing the gate, I followed the heavily wooded road into the management area. This section, known as the Clawson Trail, is blazed blue and part of the North South Trail. A little ways into the hike there is an access road that veers off to the left. I had continued straight at this point. (I would return from the other road). After passing an old stone dam on the right there is another access road, known as the Burdick Trail, to the right. 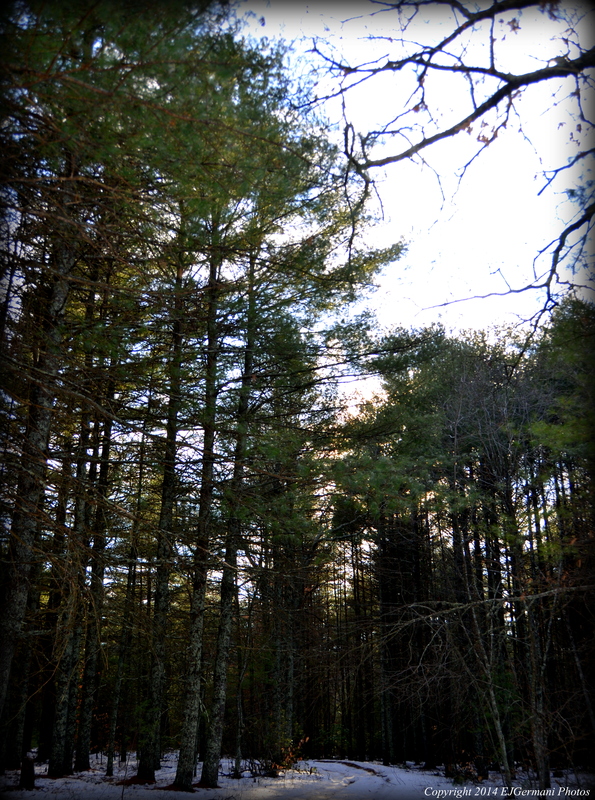 I had followed this a couple hundred feet to a clearing to view a small pond that is the source of the Buckeye Brook. I then returned to the Clawson Trail and resumed walking until I reached an intersection that had a sign for the North South going to the right. This is near the top of Shumunkanuc Hill. I went to the left here following a road that had stone walls on both sides until I reached a gated road on the right. I then followed the white blazed road to the right known as the River Loop. 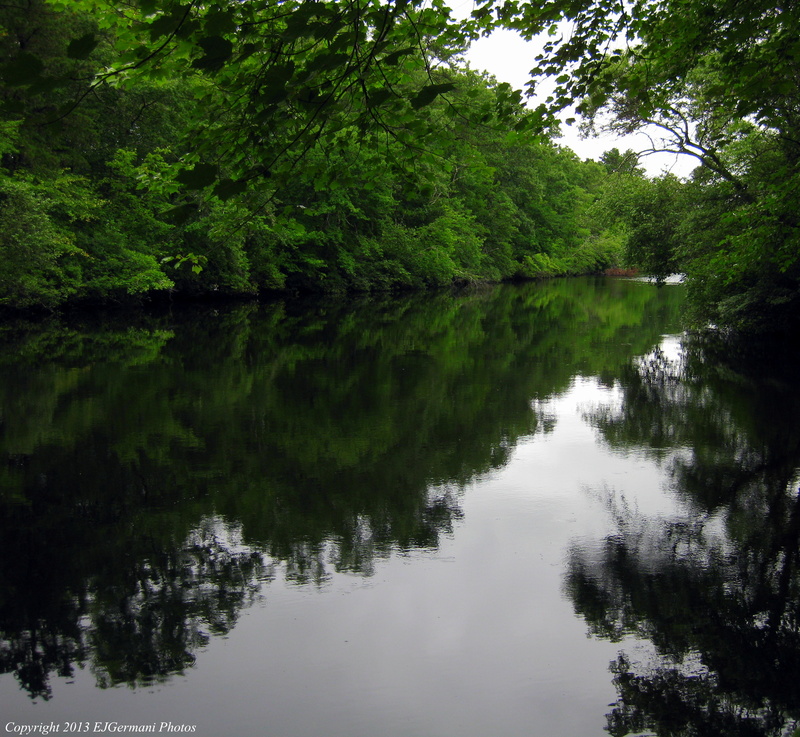 Trouncing through small areas of tall grass along the way I came to the canoe camping area along the Pawcatuck River. After lingering for a bit I continued to follow the white blazes as the road turned into a footpath. Keep an eye out for the blazes in the next section as the trail becomes very narrow and dense with growth. (At the time of this hike there is an area with a tree down and the trail is barely passable. After making your way around the tree, make sure you locate the next blaze before wandering too far.) 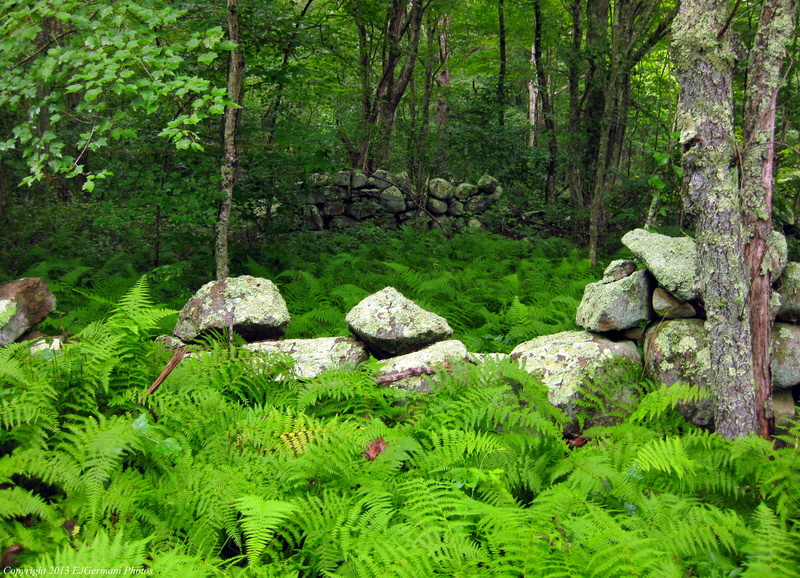 This trail is abundant with ferns as it skirts a swampy area. The trail is also muddy in some spots. At the end of this trail I turned right onto another access road called the Mill Trail. I followed this trail straight (ignore the road to the right up ahead) until it came back out to the blue blazed Clawson Trail. Along the way I accidently came across a geocache location. I then retraced my steps back to the car.